The Necklace Nebula is located 15,000 light-years away in the constellation Sagitta (the Arrow). This composite image was taken on July 2, 2011 by the Hubble Space Telescope's Wide Field Camera 3. Talk about bling! A giant "necklace" glowing brightly in space is the centerpiece of a new photo from NASA's Hubble Space Telescope. 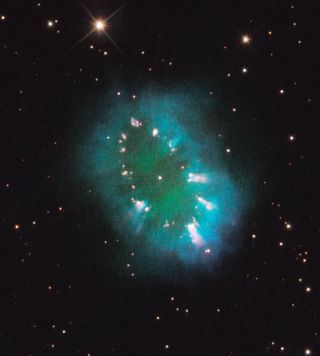 The cosmic object, which is appropriately named the Necklace Nebula, is a recently discovered planetary nebula, made up of the glowing remains of an ordinary, sun-like star. The Necklace Nebula is located about 15,000 light-years away in the constellation Sagitta. Despite the implications of their name, planetary nebulas have nothing to do with planets. Rather, the term refers to their apparent resemblance to giant planets when they were observed through early telescopes. A pair of stars orbiting close to one another produced this nebula, which is formally known as PN G054.2-03.4. About 10,000 years ago, one of the aging stars ballooned until it engulfed its companion star. The smaller star, though consumed, continued orbiting inside its larger companion, increasing the more massive star's rotation rate. As a result, the bloated companion star spun so fast that a large part of its gaseous envelope expanded into space. Due to centrifugal force, most of the escaping gas seeped out along the star's equator, producing a ring. The embedded knots are densely packed clumps of gas in the ring. The stars in the pair are so close — only a few million miles apart, they appear as one bright dot in the center of the ring. The stars are whirling so furiously around each other that they complete a full orbit in a little more than a day.